Paid Survey Update Reviews - Legit or Scam? Paid Survey Update Reviews – Legit or Scam? 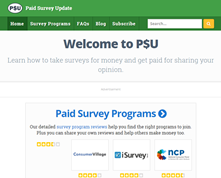 Paid Survey Update, found online at PaidSurveyUpdate.com, is a new service that promises to keep people updated and informed about how they can earn money taking paid surveys each month. The reality is that the online market research industry has become a bit more complicated than that in the last decade, and the stated goal of Paid Survey Update is to help people understand what to do to really make money within this industry while protecting themselves. Companies and brands reach out to market research companies in order to produce surveys, which in turn are distributed to people who sign up with various market research companies. When your background aligns with a market that a company is interested in, you will be offered the chance to take a survey in exchange for a minimal payment, which Paid Survey Market quotes as between $0.50 and $5.00 per survey. Unfortunately the reality of the online market research industry is that there are many companies out there looking to take advantage of people who are interested in earning money this way but are unsure of how to go about it. The goal of Paid Survey Update is to teach people how to recognize the legitimate paid survey websites from the unethical, illegal “scam” websites that attempt to take your money while giving you little to nothing in return. Is Paid Survey Update Legit? Actually, Paid Survey Update appears to be exactly what they say they are – a website attempting to help people figure out the worthwhile market research websites from the ones that are not only not worth your time, but may also be dangerous. To do this they offer survey program reviews and give members a place to share their own reviews to inform other members. They also offer their members a blog that provides people with the information they need to be most efficient and effective with making money in this particular industry. But perhaps most importantly is that this company provides a free service and is honest about the realities of working in online market research. They openly tell people they will need to complete multiple surveys a day in order to earn an average of $100 per month, and that people who are willing to put in extra hard work and effort can average $300 in earnings per month. The website is also open and honest with the fact that they are paid in exchange for placing featured advertisements for products and services on their website. In general it seems that this is a good website that is attempting to truly help people. Paid Survey Update Reviews ? Average Rating for " Paid Survey Update Reviews " is 2 out of 5 based on 1 reviews. I have $67.00 coming. What do i have to do to get it?